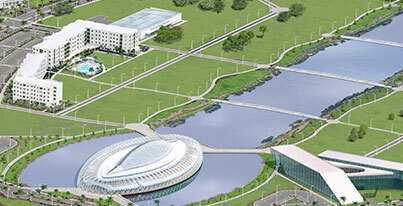 LAKELAND, Fla. – After 18 months of intense negotiations, Florida Polytechnic University announced that its administration and the United Faculty of Florida (UFF) Florida Poly chapter have signed a collective bargaining agreement. This is the first formal agreement between the University and the faculty union, which approved it unanimously on Jan. 16. “We are very pleased with the outcome of this process. We now have a brand new agreement developed from scratch, and it received unanimous support from both sides,” said Dr. Terry Parker, provost and executive vice president at Florida Poly. “As an institution that does not grant tenure, putting in place contract elements that support employment stability and review mechanisms that promote a culture of excellence in the faculty required much conversation between the administration and faculty,” he added. The agreement formalizes employment rights, responsibilities, and overall management for the faculty members. It consists of 28 articles negotiated in detail between the bargaining team that represented the Florida Poly Board of Trustees and the UFF Florida Poly chapter. Some of the most important articles deal with the process by which professors are reappointed and promoted, salaries, workload assignments, and performance evaluations. The final version of the agreement required ratification of more than half of the union members, and it was approved by a 53-0 vote. The contract was then adopted by the Board of Trustees. The collective bargaining agreement will be in place for the next three years. The next time both sides sit down at the table, the negotiations will begin with the existing agreement.